Besides face balms and face mists, masks are one of my top obsessions. They are a godsend for my oily skin and I'm often reaching for one at least once a week (sometimes twice a week, depending!). My skin gets clogged so easily and congestion is a constant problem, which affects my acne accumulation and ultimately the possibility of more PIH to deal with (ugh!). 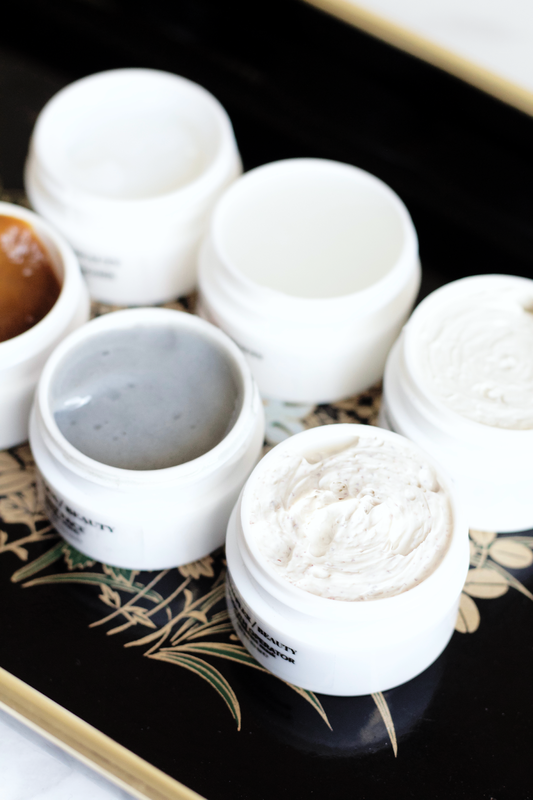 Choosing masks has always been a trial and error for me, as my skin is also really picky about consistency and overall texture. I'm biiiiig fan of clay masks but found that sometimes they would dry out my skin to such a severe degree, it would end up feeling so irritated afterwards. Luckily I've found some holy grail masks (a post will be coming soon) that I'm really happy with. But, my search for more high quality masks is never ending. Complex Beauty came into my life at such a great time. My skin has been turned rundown with stress and the up/down weather changes here in Southern California. I've been needing some masks to really treat a range of factors, including loss of moisture. 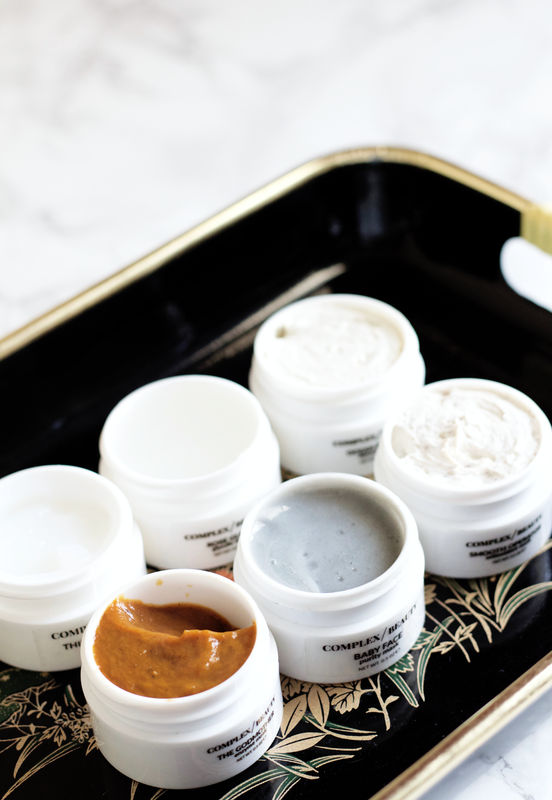 Complex Beauty's blend of selected natural and high performance ingredients has been an essential factor for helping my skin get to a better place. I also align myself well with Complex Beauty's overall mission of wanting to help women feel and look good in support of positive thinking and uplifting fellow women. They are also a cruelty-free brand, which is very important for me. They are scheduled to debut this month (!!!) and are coming out with 6 face masks, a lavender water-based facial mist, and a hydrating lip mask. Today I'll just be reviewing their face masks, hope you enjoy and get excited about this amazing brand. As I mentioned, there are 6 masks in total that have their own special skin treatment and aim. Each consisting of nourishing natural ingredients, they work as high performance properties that really deliver results. I do need to preface that this brand is not a fully 'clean' green beauty brand, but uses natural and organic ingredients in their products. 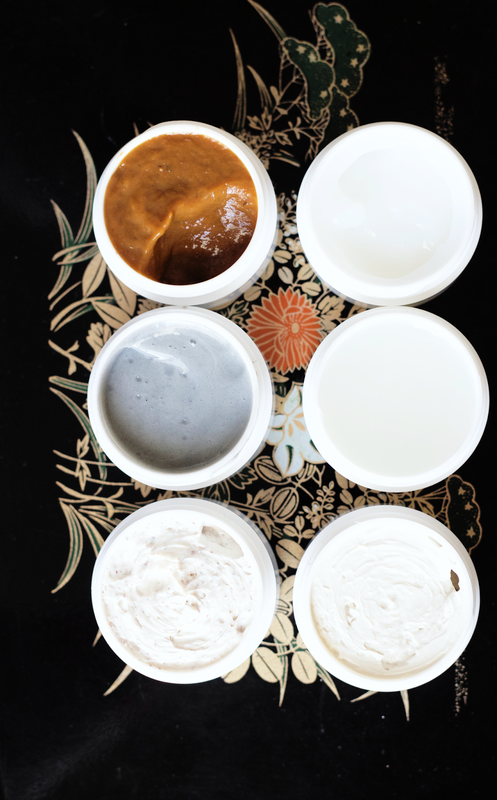 I've included the ingredients for each mask (in the next section) so that you may make a careful decision about whether you'd like to try them out or not. Rose Glow*: a revitalizing mask that exfoliates, brightens, and firms the skin with Rose Damask Water, Glycolic Acid, and Amorphophallus Konjac Mannan gum (a polysaccharide derived from the Konjac plant, has a viscous gel consistency and texture that allows it to work as a skin moisturizer). This mask is recommended for those wanting an instant glow and hydration, and longer use promotes the reduction of blemishes and uneven skin tone. Thirst Quencher*: a hydrating mask that plumps and smooths the skin with its complex blend of oils and acids that penetrate deep into the skin. It includes ingredients such as Organic Aloe Leaf Juice, Organic Rosehip Oil, Organic Jojoba Oil, Amino Acids, Frankincense Essential Oil, Organic Oat Extract, Vitamin B5 (Panthenol), and botanical-sourced Hyaluronic Acid (Cassia Angustifolia Seed Extract). Baby Face*: a purity mask that hydrates, softens, and clarifies with its antioxidant rich ingredients, promoting supple, soft, and firm skin. The activated charcoal works by pulling out dirt and toxins, while its creamy consistency stops your skin from drying out. Some of its key ingredients are Organic Green Tea Leaf Extract, Organic Aloe Leaf Juice, Organic Jojoba Seed Oil, Organic Rooibos Leaf Extract, botanical-sourced Hyaluronic Acid, Activated Charcoal, Niacinamide (Vitamin B3), Pomegranate Seed Extract, Soybean Oil, Organic White Willow Bark Extract, and Vitamin C Ester (Ascorbyl Palmitate). Ocean Potion*: a mineral mask that regenerates, heals, and balances distressed skin with seaweed and a blend of calming and skin nourishing botanicals. It leaves your skin toned and hydrated, acting also as a spot treatment to help reduce and soothe problematic skin conditions such as acne. A few ingredients included in this mask are Safflower Seed Oil, MSM (Methyl Sulphonyl Methane, the most bioavailable and natural form of organic sulphur compound, an essential mineral that is found in all living organisms), Organic Rosehip Oil, Kelp, Rice Bran Oil, Organic Wild Geranium, Sweet Almond Oil, Spirulina, Grape Seed Oil, Organic Dandelion, and Organic Aloe Leaf Juice. Smooth Operator*: a highly rich antioxidant mask that helps fight against damage caused by free radicals. It promotes preserving youthful skin by its detoxifying, repairing, and nourishing properties. Some vital ingredients in this mask are Coenzyme Q10, Organic Aloe Leaf Juice, Glycolic Acid, Squalane (olive oil sourced), Lactic Acid, Hibiscus Petals, Organic Blueberry, Organic Cranberry, Grape Seed Oil, Wildcrafted Green Tea, Organic Licorice, Seabuckthorn Oil, Red Wine Polyphenols, Organic Jojoba Seed Oil, Phytic Acid, Organic Tamanu Oil, Organic Gotu Kola, Vitamin C Palmitate (Ascorbyl Palmitate), and botanical-sourced Hyaluronic Acid (Cassia Angustifolia Seed Polysaccharide). 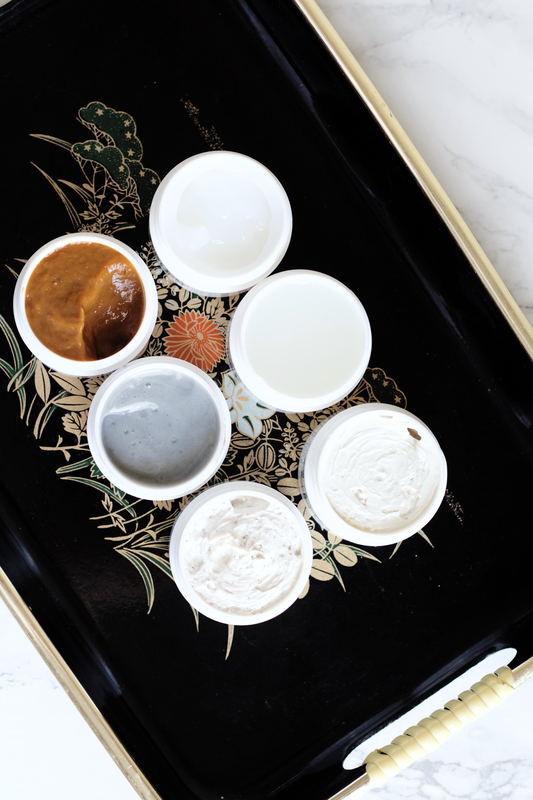 After taking testing each mask and really getting a feel for them individually, I have been so impressed by the dedication to using so many rich botanicals and high quality ingredients. Even ones like Smooth Operator (don't mind me turning on Sade as I write this) that have such a long list of ingredients are filled a big amount of these lush, skin treating botanicals. I didn't have any sort of irritation or reaction to any of the masks, either. Of all of the 6 masks, it's recommended that sensitive skin should be careful when using Rose Glow and The Godmother since they have exfoliating ingredients that may be irritating. The one negative I have about these products is that some preservatives are quite high up on the ingredient list (like Phenoxyethanol), I would prefer them to be lower but it doesn't completely turn me off from using them. Rose Glow is a cooling, viscous gel mask that works well with a double masking routine (Thirst Quencher, too). It really just smells like a heavenly pot of rose water, it's one of the nicest scents. Since it is on the watery side, it's quite interesting to try and apply it onto my face (take little bits at a time). It reminds me of a gel essence with its thin consistency and texture, rather than a face mask. It sets very softly within a minute or two and it's recommended to keep it on for 5-7 minutes. I swear my skin feels so velvety smooth when this mask is on, I try not to touch it but it's so hard not to! Afterwards my face feels properly hydrated, as the rose damask water provides such refreshing hydration while the acid brightens and exfoliates. Thirst Quencher is in complimentary to Rose Glow, another mask that is gel-like but thicker in consistency. It takes about 2-3 minutes to set and smells very herbal, which may put off some but I really enjoy this kind of scent (reminds me of some hanbang products I have). It does leave a bit of a sticky feeling as it tries to set completely but it's nothing too obvious to be irritated about (it goes away once the mask is absorbed). It's recommended to rinse off after 15-20 minutes, I usually like to stay in the 15 minute range. I think I prefer the Rose Glow than this one but I really like that it's a thicker gel consistency, if there was a way to also have that with the Rose Glow then I'd be a very happy camper. I love to just slather a bunch of this on and let it do its work. It does really well at plumping and smoothing my skin, while the Rose Glow takes all the awards when it comes to hydration. I'm in love with the Frankincense essential oil in this, as well as organic rosehip and wild geranium. Baby Face is a cooling slippery gel mask that looks a bit like concrete by its dark grey coloring. It is lightweight and has a grey tint once its fully applied onto your face. I'm honestly not even sure what its scent is, I can't really pinpoint what it smells like? It's the farthest from being floral and I would say possibly a few notches above herbal, but I think the scent may be coming from the charcoal ingredient. This does contain a waxy fatty acid blend (Cetyl Alcohol, Stearyl Alcohol, and Polysorbate 60) for emulsifying purposes. It also includes ingredients like DMAE Bitartrate, which has been studied for anti-aging and inflammatory benefits (also known to stimulate the membrane and boost cognitive function). It's recommended to rinse this off after 15-20 minutes and afterwards I did feel like there was some film left over. It is not a heavy film but I can definitely feel that it's there. I usually use an oil cleanser afterwards to get it fully off, which is not too big of a deal since I do like this mask. My skin does feel softer after every use and I do feel like it gets rid of lots of gunk on my face. The Godmother is a pumpkin enzyme mask that looks and smells good enough to eat. It smells like pumpkin mixed with lots of spices, which is really enjoyable this time of year. Since it includes ingredients like Nutmeg, Ginger Root Powder, and Cinnamon Bark Powder, it's a right mix that reminds me of Ayurvedic blends. This is definitely a mask that does its work, the glycolic acid, vitamin C, and numerous other exfoliating ingredients really pack a punch. It's recommended to leave on for 10-15 minutes and then rinse off with a wet washcloth. I find that splashing it off and using a wet washcloth does the job. This mask has little black granules that work extra well with exfoliating as you're rinsing it off. I'm telling you this mask is making me hungry for some pumpkin pie or pumpkin bread. I do have to say that this mask leaves the scent on you for a while, I can always still smell it after I've rinsed it off but a good oil or cream cleanser afterwards will get it off. Ocean Potion is a thick, white creamy mask that has an airy scent. It uses kaolin clay and purified smectite clay as its base, along with safflower seed oil, coconut oil, and a multitude of other botanical oils as treatments and softeners. What's interesting about this product is its inclusion of an Ocean Mineral Complex, a unique blend of 92 ocean minerals that activate skin enzymes for cellular function and protecting the skin. The clay base starts to set within 2-3 minutes but never gets to that dire, epic dryness that a lot of clay masks get to. It still stays creamy and is soft to the touch as it sets. One vital ingredient found in this mask is MSM (Methyl Sulphonyl Methane), which is so powerful for cell regeneration, anti-aging, and treating skin disorders like acne and eczema, etc. I really enjoy this as a clay mask, I'm still not used to how different it is compared to other clay masks that I've tried but I'm really liking it. Smooth Operator is another kaolin clay based mask but has little granules in its mixture. It is the thickest out of all of the masks and provides a very cooling sensation when applied. I really enjoy how creamy it is and the granules included are really beneficial to helping exfoliate and clarify the skin. This is the longest ingredient list out of ALL of the masks and it was a bit overwhelming at first trying to break it all down. But since this is an antioxidant mask, I really am not surprised with how many high quality and lush botanicals are included in this. One of my favorites being Coenzyme Q10, a vital antioxidant that strengthens skin cells by making them less vulnerable to sun damage and helps the elastin production our skin needs to fight against aging. I love the inclusion of vitamin C, lactic acid, and glycolic acid, as those three really provide the brightening and detoxifying benefits to this mask. The granules in this are a lot more present than in the Ocean Potion, which makes me want to believe that this also could possibly be used as an exfoliator by itself (as a cleanser/mask duo). I really enjoy the scent of this, you can smell so much of the herbs and botanicals included in this. This mask is probably my favorite out of all of them, along with The Godmother. This mask does have ingredients like Sodium Hydroxide, which can work as a pH adjuster, but it is an exfoliating property so I would be careful using this mask if you have sensitive skin. I really am so impressed with Complex Beauty and their range of masks. I'm so looking forward to trying out their facial mist and lip mask, too! I'm also looking forward to seeing the full results of these masks as I've been using them for over 3 weeks now and have been loving the results I've had. I've also enjoyed using them as double masking routines. As a self-professed mask lover, these get a big thumbs up from me. They have yet to debut but you can sign up for their waitlist to get first VIP dibs on their products. Sign up here! What do you think about Complex Beauty? Which mask has you most interested in trying out?